I am a huge theme park freak. Growing up in San Diego, my family and I would often visit SeaWorld, Disneyland, and the zoo. Damon and I even met while working at Walt Disney World – so you could say theme parks are in my blood. I was so excited to take Mini-man to visit these same places. 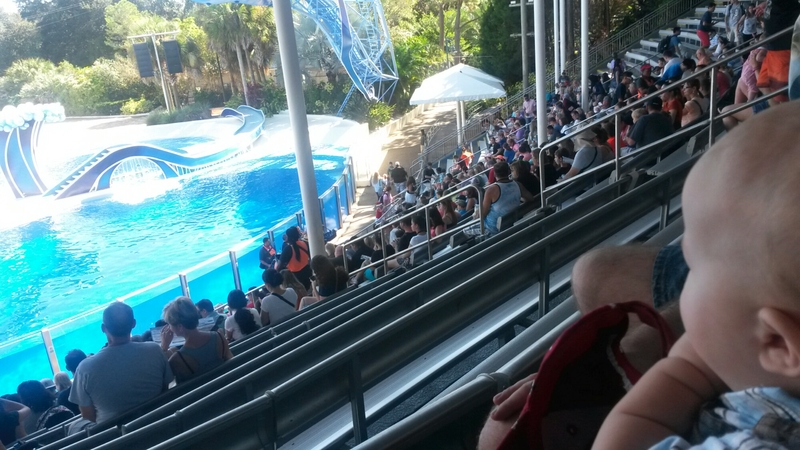 Anyways, we got to the park around 10am just in time to see my favorite show ‘Blue Horizons’ – an amazing performance showcasing the beauty and power of the Atlantic Bottlenose dolphin. We sat up high to stay out of the sun (in Florida, always seek out cover for shade or protection from rain). 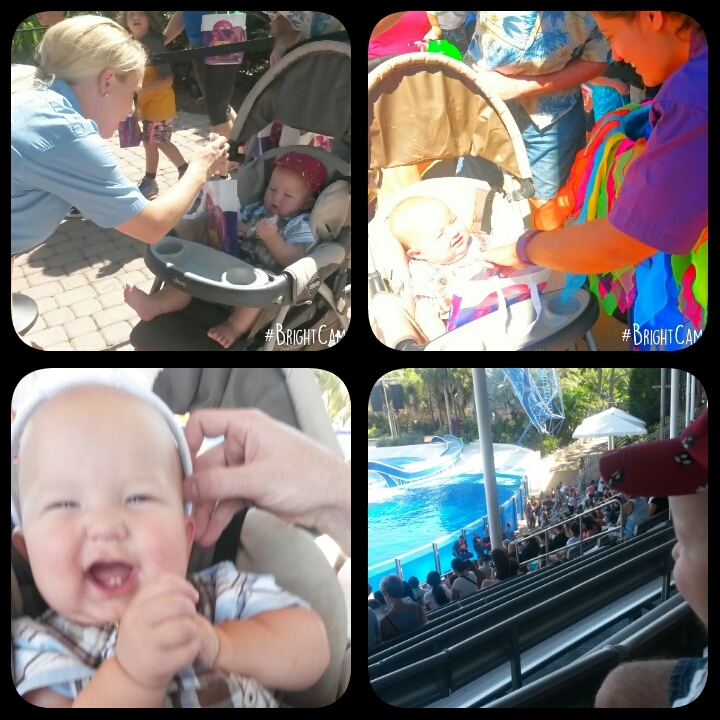 Mini-man loved watching the dolphins jumping through the air and was completely mesmerized during the show. One of the great things about visiting SeaWorld Orlando in October is their Halloween Spooktacular – included with park admission! We headed to the Bayside Pathway to partake in the festivities. The celebration offers trick-or-treating, a dance party, face painting, character meet-n-greets, and much more! Since Mini-man was under one, we decided to just walk the pathway slowly and do some trick-or-treating. 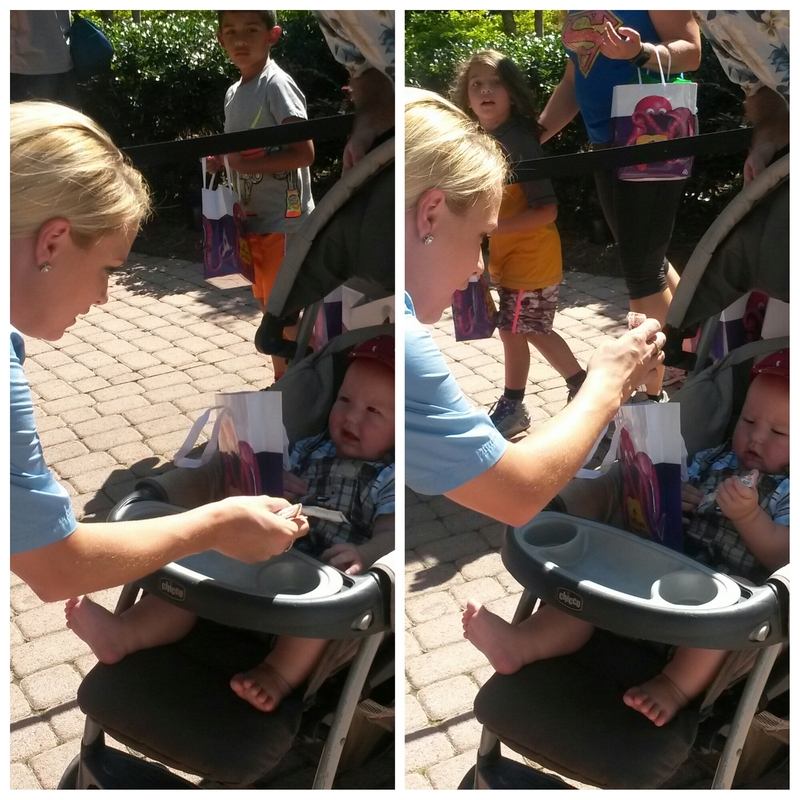 This was fascinating to mini-man – he loved reaching into the bag and pulling out the candy to play with it. (don’t worry – Damon valiantly stepped and ate the candy on Mini-mans behalf). Since the pathway ends in Shamu’s Happy Harbor we decided to try some of the attractions in this area. Much to our suprise, there was nothing that mini-man could do! All of the rides required a child to sit in their own. 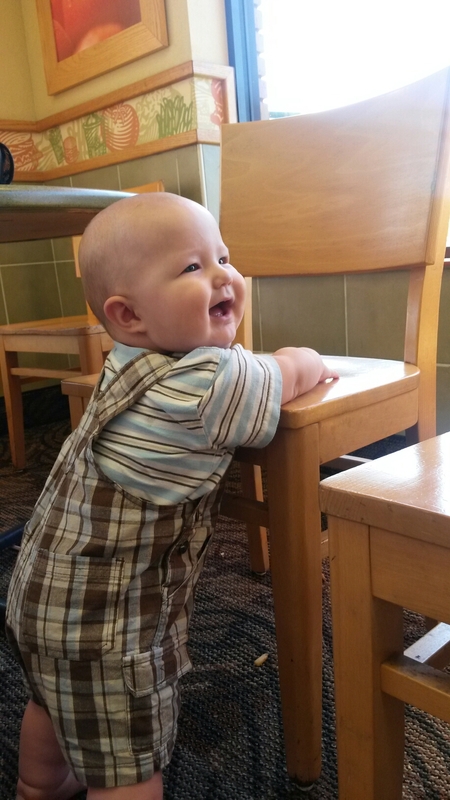 And while Mini-man could sit on his own he couldn’t quite stay seated on his own. It really amazed me that a park that markets itself to kids, wouldn’t have anything for those who are under two. Afterwards, we were getting hungry and decided it was time to leave. SeaWorld has some amazing food, but it can be pricey and a little hectic. Little tip – there is a Wendy’s, Panera, Taco Bell, and Mellow Mushroom just outside of the park (no more than a 10 minute drive). Thanks to our ‘keep things simple’ strategy, we managed to have a fun day with each other and create lots of amazing memories.